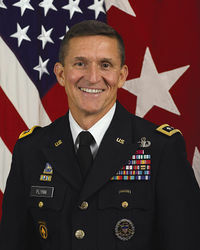 Michael Thomas Flynn (born December 1958) is a former U.S. Army General who served as the head of the U.S. Defense Intelligence Agency, and was ousted by the Obama administration for his criticism of President Obama's policy toward the Islamic State. Flynn advised candidate Donald Trump throughout the 2016 U.S. Presidential election on foreign policy matters. Flynn resigned from the position of National Security Advisor early in the Trump administration in a fake news scandal put out by the Washington Post using classified information gathered and leaked illegally by the Obama administration. On August 12, 2012 DIA chief Mike Flynn issued s report circulated widely throughout the intelligence community critical of Western aid to jihadi groups. Copies went to the CIA, FBI, State Department, Homeland Security, CENTCOM, the National Geospacial Agency and other IC members. The report documented that Western powers, that is NATO powers, along with members of the Gulf Cooperation Council (Bahrain, Kuwait, Oman, Qatar, Saudi Arabia, United Arab Emirates) and Turkey, wanted the creation of an Islamic State ("Salafist principality in Eastern Syria") to oppose the Syrian regime of Bashar al-Assad and Iranian influence in the region. Flynn had been Director of the Defense Intelligence Agency for about three weeks. Flynn opposed the Western alliance giving aid for the creation of the Islamic State. Flynn persisted in his criticism of Obama policy, and shortly after Abu Bakr al-Baghdadi declared the re-establishment of the Caliphate in Mosul in June 2014, Flynn was fired. Christians were brutally slaughtered en masse by "moderate rebels" whom Obama had given aid to. Flynn was fired for opposing Obama administration policy, and later targeted to be silenced and destroyed by Obama intelliegnce community holdovers because he knew too much and wanted to reverse Obama administration policy. Flynn moved on to be the chief adviser on national security for the Trump campaign. Trump and Flynn were determined to end Obama's support for the Islamic State, which was on a pogram against Christians, Shia, and other "infidels." Obama and John Brennan's support for the Islamic State only exaserbated relations with Russia and led to a Russian military presence in Syria - its first foreign engagement since 1989. Before Flynn made a trip to Moscow in December 2015 he alerted his former employer, the DIA. He then attended a “defensive” or “protective” briefing before he ever sat alongside Russian President Vladimir Putin at the Russia Today (RT) dinner, or before he talked with then-Russian Ambassador Sergey Kislyak. The briefing educated and sensitized Flynn to possible efforts by his Russian host to compromise the former high-ranking defense official and prepared him for conversations in which he could potentially extract intelligence for U.S. agencies such as the DIA. When Flynn returned from Moscow, he spent time briefing intelligence officials on what he learned during the Moscow contacts. Between two and nine intelligence officials attended the various meetings with Flynn about the RT event, and the information was moderately useful, about what one would expect from a public event. Flynn's call to Ambassador Sergei Kislyak, the actual audio gathered and any transcript is called “Raw FISA-acquired information,” and its distribution would be highly restricted. At the NSA, not more than 40 or so analysts or senior managers would be read into the classification sub-sub compartment that contains it, called RAGTIME-A,B,C D or P, where each letter stands for one of five different categories of foreign intelligence. "In its final days, the Obama administration has expanded the power of the National Security Agency to share globally intercepted personal communications with the government’s 16 other intelligence agencies before applying privacy protections (minimumizations)." The substance of Flynn's call was incorporated three days later into a CIA memo authorized by John Brennan intended to impugn and de-legitimize President-elect Donald Trump which was widely circulated under the new NSA rules. The Brennan memo is loaded with Russophobic innuendo. Adam Lovinger of the Pentagon's Office of Net Assessment (ONA) was invited by General Flynn to serve as a Senior Director on the White House Security Council, along with Ezra Cohen-Watnick. On the same day, James H. Baker (DOD) filed four separate charges against Lovinger. Two days before the new administration was to be sworn in Lovinger received a letter from Secretary of Defense Ashton Carter citing “Lovinger’s exceptional performance on collaborative net assessment with the Government of India.” In that same review, James H. Baker (DOD) disagreed, noting, “I do not endorse the characterization set forth in the employee input (that) Adam performed successfully.” Baker ordered an investigation of Lovinger. On May 1, 2017 Lovinger was notified that his Top-Secret, Sensitive Compartmented Information (TS-SCI) clearance had been suspended. Lovinger was the second Trump official to lose his security clearance. The loss of a security clearance is a significant matter as they are requirements for many senior positions. He was to return to the Pentagon immediately. Halper had been awarded $1.06 million in contracts through five payments beginning in 2012. President Obama had been protecting Fethullah Gulen, an Islamic mullah whom the NATO-allied government of Turkey cited as behind a July 2016 coup attempt to overthrow the government of a NATO ally. Obama refused requests for Gulen's extradition. Gulen and associates of his organization are Clinton Foundation donors. After the 2016 presidential election, The Hill published an op-ed outlining all the facts of the Obama administration and Clinton Foundation's efforts to overthrow the government of a NATO ally and install an Islamic fundamentalist sect in power. The op-ed was written by allies of the Turkish government and signed by Flynn, for which Flynn had been paid. This was considered "unregistered lobbying" by Sally Yates of the Justice Department and James Comey and Andrew McCabe of the FBI. Peter Strzok of the FBI was dispatched to interview Flynn. At first Flynn claimed he had written the op-ed himself, and later admitted he received help. For this, Special Counsel Robert Mueller charged Flynn with unregistered lobbying and lying to the FBI. Fake news accounts and illegal leaks from the Obama administration and Mueller office attempted to frame the charges as Flynn engaging in unregistered lobbying for Russia, when in fact Flynn was lobbying for a longtime NATO ally whom the Obama administration and globalists were seeking to undermine. Robert Mueller was finally forced in a judicial hearing to admit that Flynn's actions were not "treasonous" and his unregistered lobbying ended well before he entered the White House.